Halfway through New York Theatre Workshops stunning new musical Hadestown, an arrogant and powerful developer who controls a great land sings with his followers about the need to build a wall. We build the wall to keep us freethe wall keeps out the enemy! they all sing. The guy is Hades, king of the underworld. Any connection between the current Republican candidate and the eternal leader of hell is strictly coincidental. Like so much in this beautiful, haunting musical, classic themes resonate with contemporary force. The show had been in development for nearly a decadeand the song about the wall was there from the beginning so the creators are as surprised as anyone by its startling relevance. Theres no difference between what Hades is saying to his people and what you hear at a Trump rally, said director Rachel Chavkin. The musicals creative storytelling and staging comes across with the same lightning bolt of freshness and excitement that surrounded the early days of Hamiltonthough this is at the New York Theater Workshop, and Hamilton was at the Public Theater. She ultimately decided it doesnt matter if its futile or not, you have to trywhich she considers one of the messages of the show. She first performed the show in what she calls DIY community theater in Vermont, then turned the songs into an album and toured with it as a singer. It lived in the music world, though I always had the fantasy of seeing it on stage, she said. A few years ago, Mitchell connected with Chavkin, also 35, who oversaw Natasha, Pierre & The Great Comet of 1812. That inventive show (based on a portion of War and Peace) got raves in its early runs for its creative, immersive staging and is opening on Broadway in the fall, starring Josh Groban. Working together, Mitchell and Chavkin added narrative and new songs to Hadestown, and gave a deeper story for Hades and his love, Persephone. They also teamed with New York Theater Workshop, the always-impressive company which has developed Broadway hits from Rent to Peter and the Starcatcher. The show has a vibe of Americana, from a Depression era resonance to 70s rock-and-roll. The outfit that Eurydice wearswhite sneakers, a long pleated yellow skirt and midriff-baring topfeels both timeless and timely. I wanted something that invoked the Dust Bowl but that you could also see on the streets of Bushwick right now, said Mitchell. The story of wealth and poverty and exploitation has a lot of modern elements. In the original Greek myth (and dont worryyoure not expected to remember it), Eurydice is killed and her beloved Orpheus descends to the underworld to bring her back. In Hadestown, Eurydice decides to go on her own. As she sings to her lover, All the pretty songs you sing aint gonna shelter us from the wind. The chorus of three (terrific) Fates watching the action explain Eurydices decision by asking What you gonna do when the chips are down? Now that the chips are down? Said Chavkin, It was important on a dramatic level that the choice be understandable even if its not something I agree with. Capitalism is really useful but also out of control. Mitchell sees Hades as a guy whos obsessed with wealth but doesnt really enjoy life. Hes not able to take that step back and see what hes plowed under in his pursuit. Played by actor Patrick Page with a deep voice thats both mesmerizing and unnerving, Hades is very much the man of the moment. He has a blue-collar vibe, hes not a blueblood or a Kennedy, says Chavkin. Hes elegant but frightening. He puts on a suit, but you can feel the muscles underneath. Hes been married to Persephone (an alluring Amber Gray) since the world began and they used to spend six months above ground and six months below. But now the dark industrial and business forces are overcoming the brightness. Broadway veteran Page got involved in Hadestown during its workshop stage last year because I love dealing in archetype and big language and big scenes. The song where he chants back and forth with his followers about building a wall used to be a metaphor, but the rise of Trump has made it chilling as the demagogue gets his people to say what he wants them to. The song says we build a wall to keep out the enemy and the enemy is povertybut with Trump that means brown people, said Page. I sense something from the audience that Ive never felt in theater beforea fear and discomfort. The audience sits on three sides of the stage and the characters wander among them, so we can all see each other, and were confronted with this frightening reality. Hades doesnt have Trumps narcissism or aggrandizement but he wants to make money, and whether it destroys things in the process is irrelevant. Orpheus finds a way to Hades and convinces him to let Eurydice leave. Hades sets one conditionOrpheus can lead her out, but he has to trust that shes following him and not look back or hell lose her forever. Chavkin creates a heart-thumping scene as Orpheus walks through platforms in the darkened theater with Eurydice struggling to follow, far behind. The Fates come between them, singing how doubt comes in and chills the air. The whole story should be a set-up for a Hollywood endingbut that doesnt happen, said Mitchell. It was hard to know how to follow up that moment. People keep telling Mitchell that the parallels to the presidential campaign could be good for ticket sales. But she worries that the current political situation isnt good for anything. I hope these myths outlast Donald Trump, she said. I hope we all outlast Donald Trump. Whether or not the show can come close to matching Hamiltons influence, Mitchell likes the idea that standards are once again emerging from hit shows. There are so many musical influences now. Im excited that we have songs that work in the context of the show but that you can play at your wedding or on your guitar or share with friends. Added Chavkin: Shows like Hamilton and Hadestown are rooted in concert and music experience, as much as in theater. Its an incredibly exciting time for musicals. 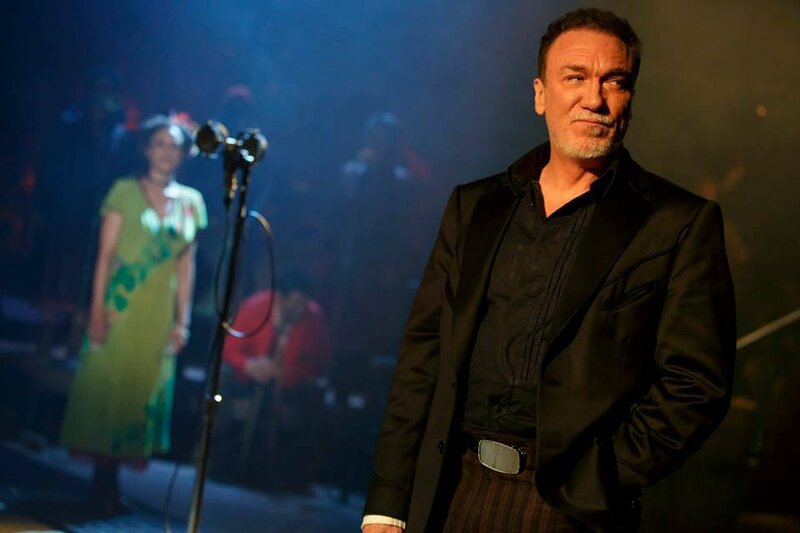 Hadestown runs to July 3 at New York Theatre Workshop.